Thanks for all the kind b-day wishes yesterday! It was such a fun day. I continue to look forward to my one Saturday a month where a spend a few hours just making my girls and houses to add to my growing rainbow neighborhood! Before next month, I realized I need to move them all to a bigger design wall. I'll be sure to include a new neighborhood picture then. Thanks once again to Angela for the challenge. Oh! And I added June's Tuesday Archives themes to my side panel. Whoop! Whoop! I get one more year in more forties! Yah! Anyone who knows me, knows I love birthdays! I'm starting my second graders day with cookies to celebrate and then we load a bus for a field trip to the city to learn more about the water cycle and plants. Yes, call me crazy but admittedly, I love every minute of it! LOL! I managed to get this layer cake sewn into a 6x7 flimsy this week during my evenings! All's I have to do is add the border and twist it like I did here. I know this is a repeat gig...but hey, when it's a good thing that's what ya do! LOL! This is actually going to be a gift to my parents. (I know your are peeking mom, as we're never good at keeping crafty secrets between us. SMILES!) In exactly one week from today...my parents will be here, soon followed by my daughter and family. YAH! We can't wait! This quilt is being made to coordinate with the Underground Railroad I made for their motor home a few years back. I know my dad will especially find the cozy, soft flannel hard to resist. A soft and cozy layer cake all lined up, awaiting for me to get home from work this afternoon. I'm working towards a Friday Finish of having all seven rows sewn together. I can't wait to sew this afternoon! This week's linky is: Color Wheels, Crafty Projects & Crazy Quilts. Click here, to fast track yourself to the linky, as it's still open. There's many cool links to check out and perhaps you'll find something in your own archives to link up as well. Anyhoo...I'm off to work. Have a great day! 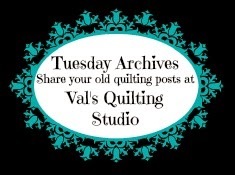 This is the linky party the let's you rejuvenate old quilting post! We're having fun! If you are new to our linky, click here for details. This week is all about COLOR WHEELS, CRAFTY PROJECTS & CRAZY QUILTS! Thank you ahead of time to Vicki and Thearica. Be sure to grab yourselves a button! My mom had so much fun making Quilt Magic wall hangings a few years back. I requested a color wheel for my studio and she happily made it for me. It hangs right where I can see it and am able to quickly reference, especially when choosing colors for a quilt. (Thanks mom!) Do you use a color wheel? Have you made a mini wall hanging quilt that's a color wheel? Please do share. Admittedly, I am not a crafty sewer, but never the less, I still appreciate and enjoy the variety of work you guys create! 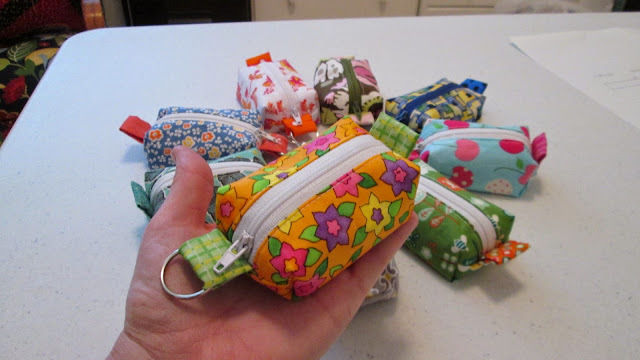 I mean did you guys see these Teeny Tiny Zipper Pouches by Vicki at A Quilter's Mission this week! They are SMALLER than a cell phone! Really! For this linky, crafty to me is defined as anything that is not a quilt...lol...so feel welcome to share any and all your sewing creations. As I showed here, a friend asked me to quilt this beautiful embroidered top. She had no request and custom work on this, I admittedly, am too inexperienced to attempt. Taking pictures of this one proved to be difficult. I didn't want to take it outside, because it's all white and not mine. (smiles) The pictures don't do it justice...but I do know it's truly going to beautify any room it ends up it. I'm pleased with the all over design of ivy and little birds. Ivy is always a wonderful accent to my own rose gardens and well, who can resist a little bird amongst a garden of roses. Sometimes I'm finding that the simplest stitch can sometime have the greatest impact. Like the use of a running stitch along a flower stem. I mastered the Palestrina Knot and like the dimension a little knot adds to a blanket stitch. Now what to do on that flower??? Any ideas??? It's relaxing having a little sampler to work on as the evenings get nicer and we can sit outside more. Speaking of nice...I have a long weekend off from teaching and the hubby is working. Make green house and girls for May RSC challenge. Catch up on all your blogs and see what everyone is up to. Taking a moment to pause and be grateful this Memorial Day Weekend. This week is all about CHEVRON (ZIG-ZAG) & CHRISTMAS Quilts! Hey! We can all use a little Christmas inspiration right before summer!! LOL!! I found Kathi's Christmas quilt and thought WOW!!! You can check out her entire Christmas project right here. I love Saturdays especially during the Spring. Today we headed out early for my elementary school's Second Annual "Run with a Cop""and "Catch the Teach" Fun Run!! The more serious runners were busy with the 5K, but my husband ran/walked with a bunch of little ones for their mile run/walk. I laughed when he commented: "Those kids talked the whole time! How do you stand it all day!" LOL!! Meanwhile, I was busy walking as fast as I could...unfortunately, all my students enthusiastically "caught up" with and passed me! They were all patiently waiting for me at the finish line with hugs and in anticipation of their promised Popsicle if they beat me! More good news, you'll notice my cooperating teacher is just a few years older than my own children. Well, he and his wife are expecting their first baby in December!! I'm already thinking: receiving blankets, quilts, burp rags. I'm so happy for them. Thanks for stopping by! Tomorrow I'll be working on the most beautiful embroidered top I've been commissioned to quilt. I'll be sure to check in and share my progress..
Wishing everyone quilty hugs this Mother's Day! Of course I was not without the company of Jackson as I played around taking pictures of my Classroom Animal Quilt flimsy. In-between throws of the tennis ball, the wind and efforts made trying to beat the incoming rain, I finally got it hung. He paused long enough in his game of ball to be included in the picture. It measures 50 inches square and will be the perfect classroom cuddle quilt. My goal is to get this quilted and binding on, for another Friday finish next week. I can't wait for the kids to see it! I'm going to have to set a timer to ensure they all get their "fair" amount of time using it during our May Marathon of Reading. I made this quilt last May (2013/before I started blogging) and wanted to get it documented here on my blog. I call it Spring Pinwheels. This is my very favorite fat quarter pattern. This lap size, takes 12 fat quarters and can literally be made in a weekend! I quilted it with a butterfly pantograph . I made it for my very favorite Aunt Carlene as an I Love You/Thank You gift. She came all the way to Oregon from Michigan for our oldest daughter's wedding. We were all so happy to have her here! Me, my mom & Aunt Carlene. Nothing like sending one of your favorite people home with a quilty hug! !